Time to set up “auto pay” through your Verizon Wireless account. According to our sources, Big Red will start charging you a $2 fee both over the phone and online for your monthly bill transaction unless you have your account set up to pay automatically. I know this news won’t excite most of you, but know that there are still plenty of options to get you out of having to pay this “convenience ” charge. We have all of your options listed below. 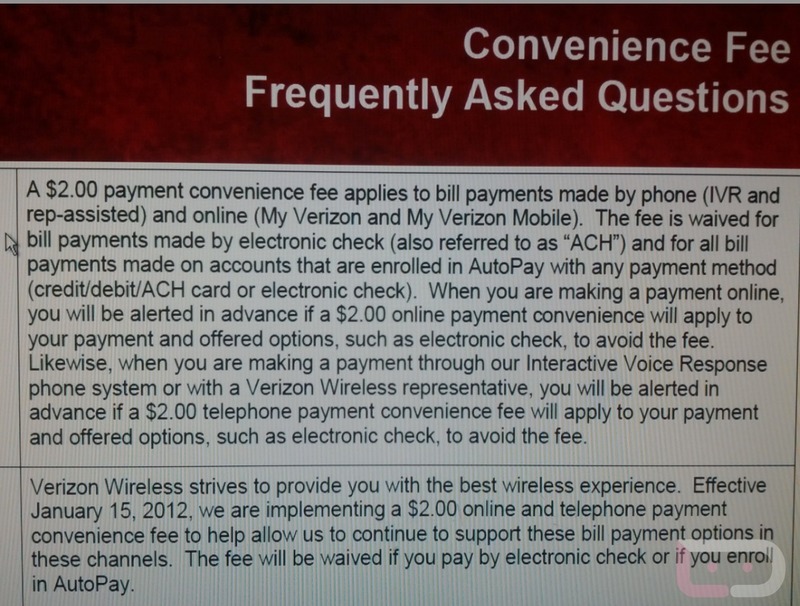 This new $2 fee will allow Big Red to “continue to support these bill payment options.” Mmmhmm. Below is the confirmation that has been released by Verizon. Verizon Wireless offers customers numerous free and simple payment options and we encourage customers to use those options. Starting January 15, a new $2 payment convenience fee will be instituted for customers who make single bill payments online or by telephone. There are a couple of exceptions. See below. The fee will help allow us to continue to support these single bill payment options in these channels and is designed to address costs incurred by us for only those customers who choose to make single bill payments in alternate payment channels (online, mobile, telephone). It is waived for those who pay by electronic check or enroll in AutoPay — we encourage customers to use those or other payment options that incur no fees. [See complete list below.] The telephone and online single payment fee, which takes effect January 15, will be disclosed up-front and throughout the transaction. Electronic check online (My Verizon Online, My Verizon Mobile/Handset). Fee waived. Electronic check via telephone. Fee waived. Online from the customer’s home-banking service provider website; fee does not apply. Credit/debit/ATM card, electronic check or cash at a Bill Payment Kiosk, Panel or with a representative at a Verizon Wireless Communications Store; fee does not apply. Paper check or money order mailed to the VZW remit address on customer’s bill; fee does not apply. Update: They gave into customer complaints and have now decided not to institute this fee. Verizon: 4G LTE Outage Resolved Overnight, 3G Operated Normally?